Leather is the primary material for footwear, handbags, small personal leather goods, belts and gloves. It is used for ties, jewellery, hats and luggage. It is used in other industries as well, including apparel, upholstery and industrial belting. Leather is considered a by-product; it comes from the skins of animals raised for food. Cattle, calves, sheep, lambs, and goats are the primary sources for hides processed in the United States. The leather industry in the United Sates today is quite large. It includes companies that tan and finish raw or curved hides and skins into leather and converters, or dealers who contract the processing of their hides and skins employing 18,500 people. Most of the tanners are located in Northeast, Midwest, Middle Atlantic States and California. The leather produced becomes the raw material purchased by manufacturers of footwear, luggage, handbags, personal leather goods, gloves, clothing, furniture and automotive parts. These industries provide over 200,000 additional jobs. In 1983 the footwear industry used about 60 per cent of all domestically produced leather. The decline of the domestic shoe industry has led to a decline in the leather industry. Although the words hides and skin are often used interchangeably, the leather industry has specific designations. HIDES come from animals like cattle, horses and buffalo whose skin weighs over 20 pound. SKINS come from the younger, smaller animals like calves, goats and sheep and weigh under 15 pounds. The United States, in fact is a leading producer of cattle and cattle hides. In 1983, the United States produced 36.3 million hides, 22.3 million of which were exported. Even in a period of strong dollar, the United States is still a major exporter of hides and skins. 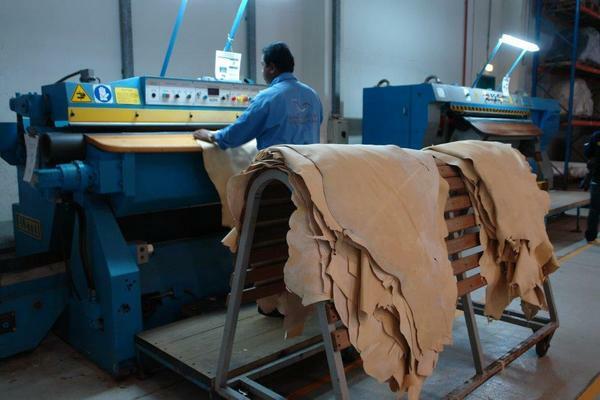 International trade regulations and barriers have restricted the leather industry. The tanning process creates waste that has been the subject of Environmental Protection Agency regulations. Food animals are slaughtered by meat packers and processors whose methods should meet national health standards. The hide is removed quickly and carefully to avoid damage to either skin or meat. After this it is cleaned and treated immediately in order to prevent decomposition. 1) Curing: Today, the most common curing method involves use of salts. In wet-salting, the hides are washed, and then stacked flesh side up. The flesh side of each hide is covered with a layer of salt and the stacked hides are left for few days until the salt is fully absorbed. 2) Cooling: When the cured hides arrive at the tannery, they are placed in cool, ventilated storage areas. The hides are placed in vats or drums for soaking with detergents and disinfectants. 3) Trimming and Siding: Cattle hides are often trimmed and cut in half down the back to form side leather or a half hide. 4) Fleshing: The flesh side of the hide is scraped to remove unwanted material. The hide is then bated or washed with chemical agents to remove the alkali and lime that the hide has absorbed. 5) Pickling: It is the addition of salt and acid leaves the hide ready to be tanned. Oil Tanning: It is an ancient method. This is done by rubbing fish oil into the hide. Once the hide becomes leather, the remaining oil is removed. Vegetable Tanning: Tannic acid is extracted from ground bark, wood or other tree and plant parts and mixed with chemicals. Vegetable-tanned leather is tan in colour, strong,durable and water-resistant. It is used for shoe soles, luggage, upholstery, industry belting. Chrome Tanning: It is one of the common tanning methods in the United States. The hides are placed in vats with chromium salt solutions. The resulting leather is bluish-green, durable and scuff-resistant. Although it is stronger than vegetable –tanned leather, it is not a water-resistant. It is used for shoe uppers, apparel and handbags. Alum Tanning: It is a mineral tanning process similar to chrome tanning. It is used for glove leather. The alum solution tans in a few hours but the leather then requires a long resting period. Alum-tanned leather is white and soft, but water makes it stiff. Formaldehyde Tanning: The tanning produces another white leather. It is soft and flexible and may be washable. After tanning, excess moisture is wrung out of the leather. 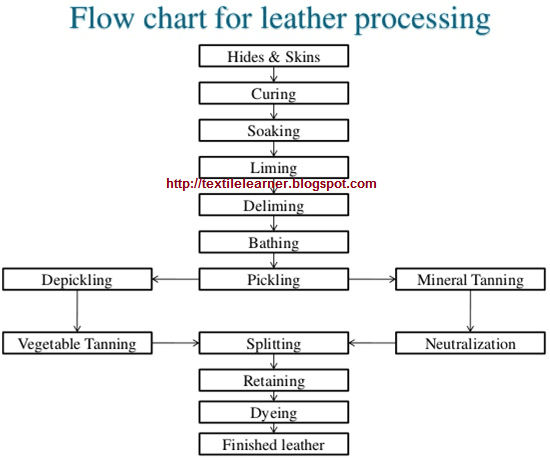 7) Fat liquoring process: The process adds to the strength, smoothness and flexible of the leather. Hanging: The skin is placed over a horizontal bar and passed through an oven. Toggling: The skin is stretched and clipped to a frame and then passed through an oven. Pasting: The leather is pasted to steel plates and then passed through an oven. Vacuum Dryer: The skin is put between the solid plate and a perforated plate with a felt and then vacuum is used to remove the water, this process is frequently used for spot drying. 9) Staking: After drying, the leather is sprayed with a mist of water which is left to absorb overnight and then leather is softened. 10) Buffing: Buffing on the grain eliminates any surface imperfections. Leather that are not buffed are said to be full grain. Leather has good tensile strength. It could be stretched lengthwise a great deal without tearing. It retains its flexibility under normal temperature variations. It has good resistance to puncture no matter how thinly it is split. Leather is porous; therefore it allows excess body moisture to evaporate. It can be moulded into a shape and retain that shape. Polish leather shoes regularly to maintain their appearance and durability. Leather apparel or gloves labelled washable should be washed in a mild soap solution, rinsed, rolled in a dry towel, and then laid out flat to dry. Avoid direct sunlight. Leather apparel labelled “dry clean only “should be cleaned by specialists in leather care. Wet leather garments should be hung on a wooden hanger or dry away from direct heat. Wrinkles in leather garment will usually hang out if the garment is hung in a damp room. If it is necessary to iron leather, place a layer of brown wrapping paper between iron and the leather. Suede apparel should be dusted regularly with a terry towel. A towel can also be used to raise the nap after wet suede has dried away from direct heat. Very dirty suede garments should be cleaned out by professional leather specialists. Leather from the cattle family is primarily domestic but may also be imported from South America. Bull hide, steer hide, cowhide: All full-grown cattle. Used for shoes, luggage, upholstery, machine belting, and handbags. Kip skin: Larger than a calf but not full grown. Used for shoe uppers,handbags, and belts. Rawhide: Unbanned cattle hide stuffed with grease and oil, used for industrial purposes and shoelaces. Vellum: Tanned calfskin similar to parchment. Used for writing surface or book covers. Reversed calf: Heavy napped calfskin buffed on the flesh side and containing oils for water resistance. Used for heavy-duty shoes. Scotch Grain: Cattle hide or calfskin with a pebble texture embossed on it. Used when textured skin is fashionable. Leather from the goat family is imported primarily from Europe, Asia, Africa and South America. Goatskin: From a mature goat. May also refer to kidskin. Used for gloves and shoes. Kidskin: Fine grain skins from young goats. Used for shoe uppers, gloves, apparel, handbags, purse accessories, and book covers. French kid: Vegetable-or alum-tanned kid, originally from France. Often used for gloves. Morocco Vegetable: Tanned goatskin which has been boarded for a pebbled grain. Originally Moroccan leather used for purse accessories and book covers. Glace or glazed kid: Goatskin or kidskin that has been chrome tanned, dyed, and glazed. Used in the same ways as goatskin or kidskin. Leather from the sheep family comes primarily from North and South America, Australia and Africa. Sheepskin: From mature sheep, used for gloves, shoes, apparel and handbags. Lambskin: From young sheep, appears the same as sheepskin after tanning. Used for shoe uppers and linings, gloves, apparel, handbags, hats, sporting goods, and book-covers. Doeskin: Sheep and lambskin buffed on grain side; often white. Soft and supple. Used for ladies gloves and sometimes used for apparel. Chamois: Oil-tanned and suede-finished flesher, soft and yellowish, originally from a chamois antelope. Used for gloves, garments and polishing cloth. Parchment: Tanned sheepskin. Used for a writing surface, diplomas and lampshades. Hair Sheep: Sheep with wool resembling hair. Horsehide: Hide from horse or colt. Used for baseball, mitts and jackets. Coltskins: Skin from young horse. Used for apparel. Cordovan: Leather from the shell section of a horse’s hind quarters; originally referred to as leather from Cordova; very durable, long-wearing. Buckskin: Skin from elk or deer that has had the grain removed; fine, porous. Used for shoes, gloves, etc. Deerskin: Skin from elk or deer with the grain remaining. Primarily used for gloves. Sealskin: Skin from Arctic seals. It is often copied by boarding other leathers. Used for Handbags. Walrus Skin: From a walrus; actually very thick. Thick skin is used for jewellery buffing wheels. Although some leather skins are sold at retail level, most of the leather is bought by manufacturers to be made into finished products. Leather comes in wide variety of colours and finishes. Although leather prices are high and there are many synthetic competitors, consumers still demand leather. Chemical advances have made leather adaptable for many different applications, from apparel to home furnishings. Many leather firms employs a fashion staff in order to analyse the trends in design, fabrics and colours as it takes too much time to tan and finish hides, so the leather industry must work further ahead than any other fashion industry. The leather companies, therefore, prepare material on colour and texture, including swatch books discussing the coming leather colours and suitability to different apparel looks. Each September in Paris there is an international leather fair, the Semaine du Cuive. Tanners come from all over the world to exhibit and sell their leather to manufacturers. In turn, retailers buy the finished goods from manufacturers. Leather Industries of America (LIA) in Washington,D.C., is the trade organization for the industry. It is involved with a variety of industrial activities including compiling statistics, predicting colour trends, preparing educational material, interacting with government agencies and conducting research through the Tanners Council Laboratory at the University of Cincinnati.